The gun business is creating harm in Ghana and among the neighbors: Locally made guns business flourish in Ghana. Blacksmith Sarpong, 35, operates a small shop in Ghana’s second largest city, Kumasi. He is trained to produce cooking utensils, but prefers to make guns as he can earn more money that way. Sarpong sells to clients using a gun-runner – most of them are ex-peacekeepers or mercenaries according to the UN Office on Drugs and Crime – in a growing clandestine small arms industry, according Ghana’s Deputy Interior Minister, Kwasi Apea-Kubi and confirmed by police officials. Small arms proliferation destabilizes West African countries and has increased the intensity and human impact of conflicts in the region, according to regional arms experts. Apea-Kubi recently toured the country to ascertain the state of Ghana’s small arms industry and along the way met with hundreds of gunsmiths who “openly admitted to producing guns”, despite that local small arms manufacturing is illegal. “We know now that many of the armed robbery cases we are witnessing are being fueled by these small arms,” Apea-Kubi told IRIN. 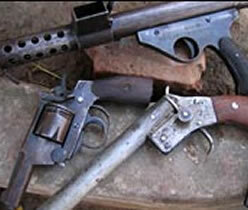 Eighty percent of firearms Ghanaian police confiscate are homemade, according to Accra-based NGO Africa Security Dialogue and Research. Gun production estimates vary. The National Commission on Small Arms, set up in 2007 to check the manufacture and cross-border movement of small arms, estimates 40,000 Ghana-made guns are in circulation; UNODC estimates 75,000, while Kwesi Aning, head of the conflict resolution department of the Kofi Annan International Peacekeeping Training Centre in the capital Accra, puts the figure at 200,000. “Local production has recently gone through the roof,” Aning told IRIN. 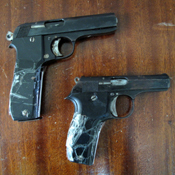 Blacksmiths have the knowledge and skills to manufacture single-shot pistols, multi-shot revolvers and shotguns, according to UNODC. When IRIN investigated a locally-made pistol sale in Tudu neighbourhood – Accra’s small arms hub – a dealer known only as Musah would not go lower than $130 for a single-barrel shot gun. UNODC’s July 2009 West Africa threat assessments report establishes a direct link between trafficked arms and instability in the region, with the chief clients of clandestine arms groups seeking to overthrow or challenge state authority. “Instability in Togo, Nigeria, and Côte d’Ivoire has resulted in higher prices of Ghanaian manufactured arms,” Aning said. Ghanaian gunsmiths have been invited to teach their gun-manufacturing skills to local blacksmiths in the Niger delta, Aning said. However buyers of Ghanaian guns tend to be individuals while established insurgent groups purchase heavier weapons from outside the region, according to UNODC. The government is seeking creative solutions to the problem, the Interior Ministry’s Apea-Kubi told IRIN, as past arrests and detention of guilty blacksmiths have only pushed the trade further underground. “We know we have to do something but we don’t want to use force,” he said. Interior Ministry officials are consulting gunsmiths across the country to explore how to attract them to alternative – legal – ways of making a living, as well as to examine how to prevent cross-border trafficking. Apea-Kubi also hopes gunsmiths will allow their names and locations to be logged on a national database so their activities can be monitored. At least that way the industry will be less secretive, he said. At the same time I have much sympathy with the blacksmith Sarpong in the article. US$1,000 a week is a fabulous income in Ghana. It would be very difficult to voluntarily give that up. I would certainly find it difficult if I had the skills and was making that money in Ghana. Drug dealers and thieves like handmade guns because they can get them under the table and don’t have to register them with the government. But, handcrafted guns didn’t used to be such a problem. Blacksmiths in Ghana have been making them for centuries, mostly for hunting and protecting farmland. When the British came in, they outlawed gun-making — but the demand continued. Blacksmith Philip Nsiah lives five hours north of the capital. … Nsiah says local guns are cheaper than imported ones, so they’re popular with farmers. He used to sell each shotgun for about $100. Those cheap pistols I saw earlier can go for as little as $4. Nsiah trained for years to learn his craft. But then he found out how much harm these guns cause. Nowadays, he helps lead the local blacksmiths’ association, encouraging others to stop making illegal guns. Nsiah: I can do any type of gun. If they allow me, I can do it. But since, I know the dangers involved that is why I don’t go in. When the crime rate got bad, the police started rounding up blacksmiths. Many stopped making guns, because they didn’t want to be arrested and lose their legitimate business. The crackdown helped. But it pushed the industry underground. Now, Police Superintendent Aboagye Nyarko says they’re encouraging blacksmiths to produce something else, like tools to prune cocoa trees and handcuffs for the police. Blacksmith Philip Nsiah shows me some handcuffs he made seven years ago. Nsiah: But you see, it’s still there rusting. Nobody is buying it. But he’s been able to make a living without making illegal guns. He repairs authorized weapons, used by security personnel, he works on cars. And he’s made a tool-shed full of other products — garden shears, hunting traps and gong-gongs, or cowbells for making music and calling community meetings. Nsiah says the government hasn’t been effective at promoting these types of alternative products. And without that backing, illegal handmade guns will continue to be the product of choice for many blacksmiths. Ghana has enormously talented craftsmen. In general people are inspired by the hope of creating and accumulating for themselves and their loved ones. People in business understand business, understand its potential and its motivations. So businessmen and women should be far better suited to being partners in development than eleemosynary organizations, provided their motives are not entirely exploitive. I may sometimes write as if I am anti capitalist, but that is not the case. Capitalism needs the regulation of democratic controls, otherwise it is the same as organized crime, but the hope of accumulation drives all of us. That is why I particularly liked this quote from the following article: what poor people need most is a way to make more money. As he pours dangerous molten metal from a home-made furnace at a ferocious 600 degrees, a worker flings a skimpy T-shirt around his head for protection. Another worker grabs a chunk of mud and shoves it into the makeshift foundry to plug the flaming lava flow of molten metal. None have safety helmets or other equipment. Their neighbours at nearby industrial workshops are wearing plastic flip-flops and shorts. Their welding cables are ripped and exposed, risking a high-voltage shock, and few of the welders wear safety glasses. Safety is an afterthought for the 200,000 people in horrific conditions in one of Africa’s biggest industrial slums. Survival comes first, and they need to eat. 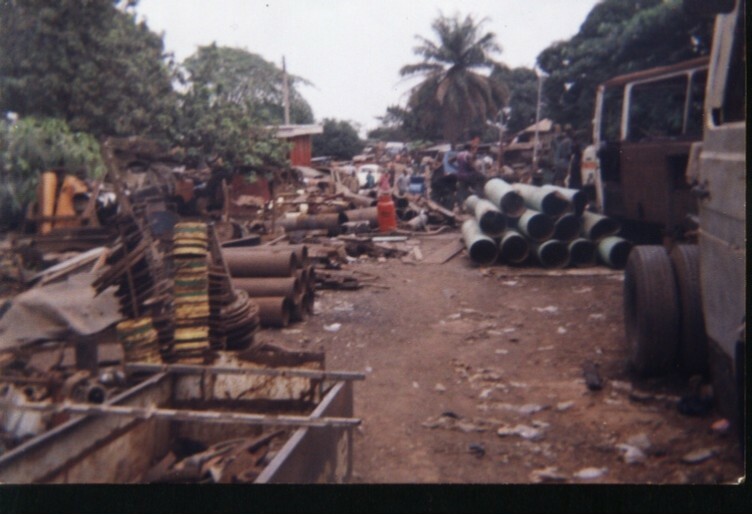 The slum, known as Suame Magazine because of its origins among the artillery-makers at a local armoury, is a 180-hectare cluster of 12,000 repair shops and small-scale metal works on the outskirts of Ghana’s second-biggest city, Kumasi. At first glance, it seems like a vast wasteland of tin shacks and wrecked cars and impoverished mechanics, where the dust-choked air is filled with hammering, banging, pounding and shouting. But some look at this post-apocalyptic junkyard and see hope for the future. If the small-scale artisans and repairmen can be linked into the supply chain of multinational corporations, could they escape poverty and work in safer conditions? That’s the experiment a Canadian group has launched. With a new aid philosophy that aims at business-oriented solutions, the Canadians are marketing the skills and ingenuity of the slum-dwellers, connecting them to foreign investors and helping them bid on valuable contracts that could transform their lives. “My heart beats faster just thinking about this,” says Florin Gheorghe, a 21-year-old engineering student at the University of British Columbia who has been immersed in this giant scrapyard for the past seven months. Though the mechanics and metalworkers of Suame Magazine are poorly educated and 98 per cent lack any Internet access to help them seek customers, many are astonishingly skilled. Some build entire buses or fuel tankers from scratch, or design drilling rigs or foundries. All they need, the Canadians believe, is a helping hand to market themselves. Mr. Gheorghe, supported by a Canadian non-profit group called Engineers Without Borders, arrived at the slum in January to work for its industrial development organization. He put on a suit and tie and began knocking on the doors of multinational companies around the city, giving out his business card and sending a deluge of e-mails to companies around Ghana. After weeks of going door-to-door, he and his colleagues began to persuade some companies to award business to slum-dwellers. They won contracts at several major U.S. companies, including Newmont Mining Corp., Coca-Cola, and the cocoa division of Archer Daniels Midland Co. Under the first Newmont contract, valued at $30,000, the Suame Magazine artisans and repairmen were hired to build stairways, railways and platforms for massive Caterpillar trucks at the mining company. It was followed by agreements on further contracts from Newmont, providing the much-needed prospect of steady revenue for the workers. … amusement and disdain soon gave way to respect as the mining company saw what the artisans could produce. One group of 10 workers earning less than $4 a day were able to double their income when they landed the Newmont deal, with the prospect of further revenue from profit-sharing at the end of the contract. The contract helped them learn new skills, including the ability to read computer-aided engineering drawings. And it encouraged them to invest some of their profit in safety equipment. For the first time, they have switched to steel-toed boots and safety glasses, instead of flip-flops and bare eyes. George Roter, the Toronto-based co-founder of Engineers Without Borders, says the project in Suame Magazine is an innovative approach that could produce broader lessons for the foreign aid sector. “The concept of stimulating business development using demand from international resource-extraction operations could be powerful in many countries in sub-Saharan Africa,” he said. As for Mr. Gheorghe, he is returning to the University of British Columbia this fall to finish his engineering degree after seven months of toil in the slum. But he’s already planning a life of activism. He is convinced that he can find more capitalist innovations to help the developing world. I like Mr. Gheorghe’s ambition. A respected legal practitioner and lecturer at the University of Ghana, Law Faculty, Dr. Raymond Atuguba has chillingly revealed that militants in the Niger Delta region, notorious for blowing up oil pipes, kidnapping and demanding huge ransoms and causing unrest in the oil rich Nigerian region have started tripping to Ghana in droves. Dr. Atuguba stopped short of stating the exact ‘lessons’ the Ghanaians could be taking from the ‘visiting’ militants, but said people were preparing to protect their interest. He remarked that if the security agencies were on their toes, they would have noticed the movement of arms. Dr. Atuguba is of the view that the culture and livelihood of the people located at the coast of the region will be greatly affected due to the infiltration of various forms of social vices the region will have to embrace. Dr. Raymond Atuguba who is also the director of the Law and Development Associates warned that it will be ghastly to ignore the concerns of those communities. “We should not underestimate it…”he advised. I wonder about this. The oil in the west will be offshore, so, other than potential oil spills, the environmental degradation should not be similar to the Niger Delta. There are certainly some in the Western Region who feel agrieved. And there is much potential for them to feel more agrieved. I also get the impression that there are those who want to stir up more trouble over oil in the west. When I asked friends about this they said it was someone trying to make trouble, but I think this was more opinion than information. I wondered when I first read this story whether it might be part of a US Africa Command “information operation”. I don’t have enough information myself to make an intelligent guess. Dr. Atuguba may be trying to do his best for the people of the Western Region. Land ownership issues are huge throughout Ghana, and are particularly bad around cities and towns, but hardly limited to the urban areas. If the militants are visiting the Western Region, it is unlikely they are there to learn gunsmithing, because the skilled practitioners are likely to be in the larger urban areas where there are more customers. The proximity of Ivory Coast, and its recent civil conflicts might be a factor if there are organized militants in the area. I am doubtful about how much organization there is at this point. People from the Niger Delta are moving away in many directions, to avoid the problems there, and to try and make a living. Unfortunately some bring criminal training and skills with them. The government needs to listen to the people in the Western Region and throughout Ghana. The business model in Suame Magazine working with the Canadians, described above, is something that the government and other organizations interested in development should look at long and seriously. And suggesting people go into another form of business, as with the gunsmiths like Mr. Nsiah or Mr. Sarpong, without assisting them to reach current markets or create new markets, is a waste of time and effort.